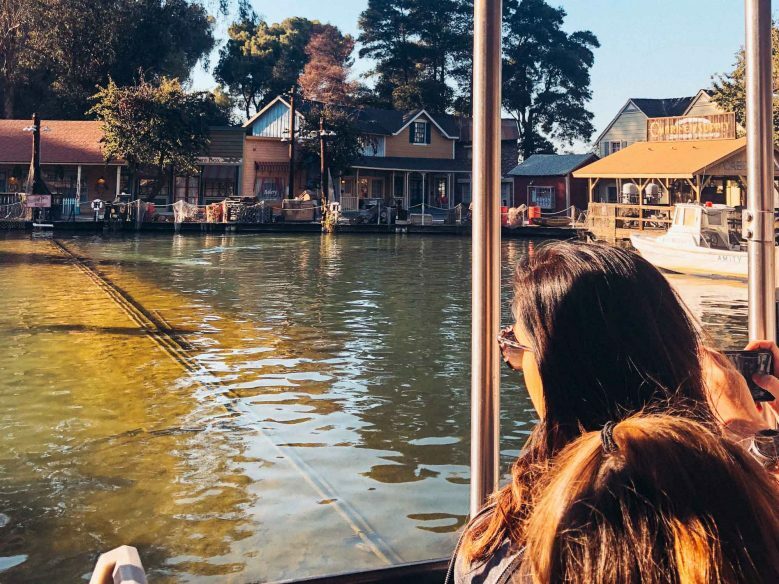 Are you wondering if it’s possible to visit Universal Studios with a baby or toddler, and for the whole family to still have an amazing time? Before we went to LA, I thought the answer would be no, but after spending a brilliant day at Universal Studios Hollywood with our then 10-month-old baby, I can confirm that it definitely is possible and 100 per cent worthwhile. It was one of the highlights of our California road trip. 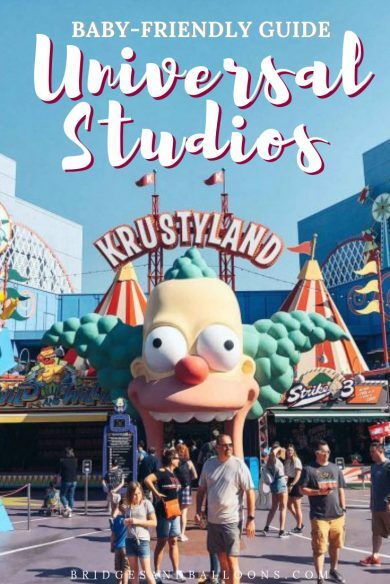 Here is my guide to Universal Studios Hollywood for toddlers and babies, featuring top tips for making the most of your day at the park. The key thing you need to know about when visiting Universal Studios with a baby or toddler is the the Universal Studios Child Switch program, which means that if any child in your group can’t go on a ride, one or two adults can wait with them in a special room at the front of the queue. Once the rest of the group are done on the ride, they can switch with those who were waiting with the child, without having to wait in line again. This is a super useful way to be able to go on the rides without taking turns to queue. Of course, if there are only two of you, it means you have to go on the ride alone, which isn’t always as fun as riding together, but seeing as most rides at Universal, aside from the studio tour, are 3-D experiences, I personally don’t think it makes a whole lot of difference, especially as you can meet with your group immediately afterwards. The only problem is, you still have to queue with the child, so they may get bored while waiting. That’s why I’d recommend combining it with the Universal Express Pass. It’s not cheap, but the Universal Express Pass is well worth it if you have the money. It means you can use the express line for most of the top rides, attractions and shows and therefore skip the long queues. This is invaluable with a baby or toddler as it means you don’t have to contend with them getting bored in all the long lines. We had one and loved it as it meant we never had to wait more than about 5 minutes to go on a ride (aside from the Simpsons ride, which still took about 15 minutes). The Universal Studios Hollywood Official App is a really handy way to plan out your day. You can favourite all the rides, attractions and restaurants you want to see, and then use it to track the different wait times. It also lets you know where to go to meet all the different characters. Can you do the studio tour with a baby or toddler? One of the highlights of Universal Studios Hollywood is the studio tour where you get to go behind the scenes of the historic studio lot, which features sets from lots of favourite movies and tv shows. It’s a working studio, so if you’re lucky you might also catch a glimpse of one of the stars. 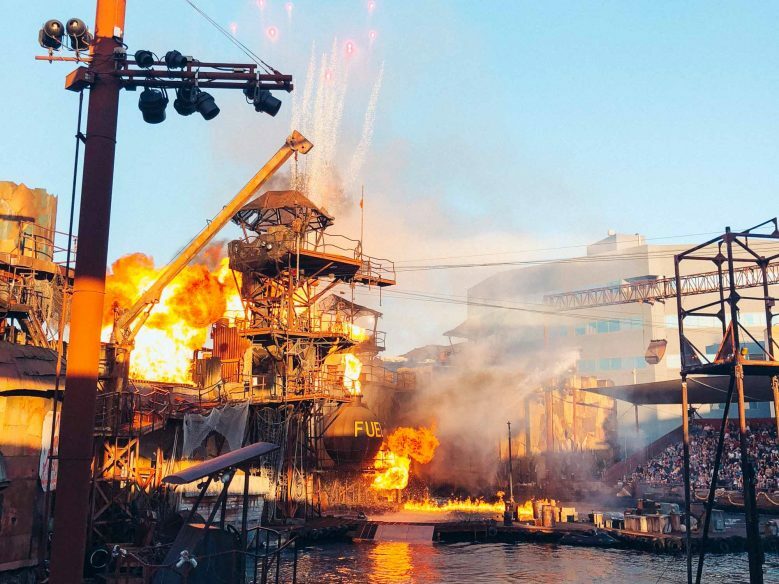 It has a focus on special effects and, while the entire tour takes place on a little tram, is also connects up to various simulator experiences where you put on 3-D glasses, including a King Kong 360 3-D ride, and the Fast and Furious 3-D grand finale. 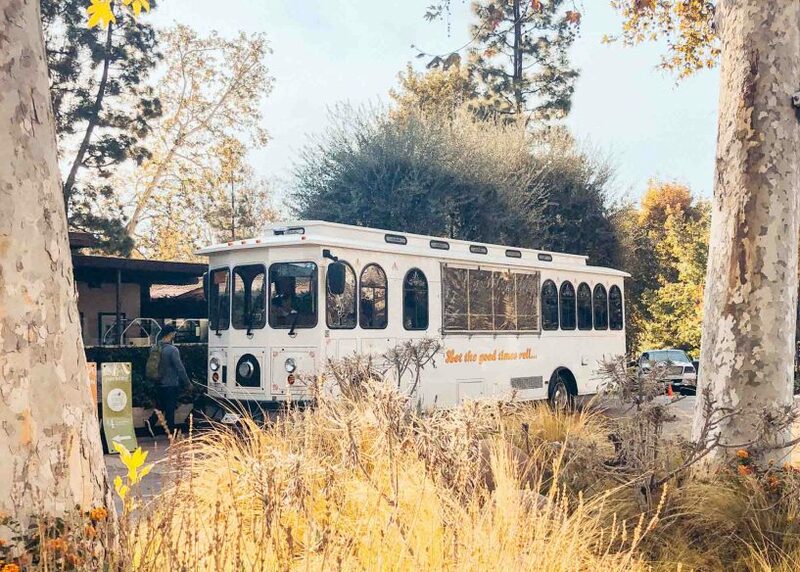 You can take babies and toddlers on the tour, but these experiences might be a bit too intense for them and there’s no way to get off the tram for individual bits. Personally, I wouldn’t recommend it, but if you have a particularly brave toddler or know that you’re baby wouldn’t be bothered then it is a possibility. Unfortunately, the tour takes 60 minutes, so it’s a long one to take turns to do. Plus it’s one of the only rides at Universal Studios, which is definitely best enjoyed with company. That said, I did it by myself and loved it! 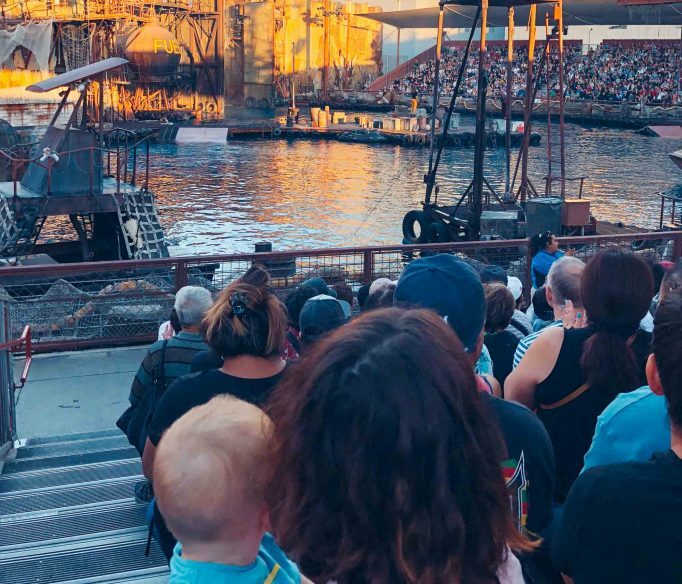 Can you go to the Water World show with a baby/toddler? The Water World show is another Universal Studios highlight and often features recognisable actors from Hollywood shows. 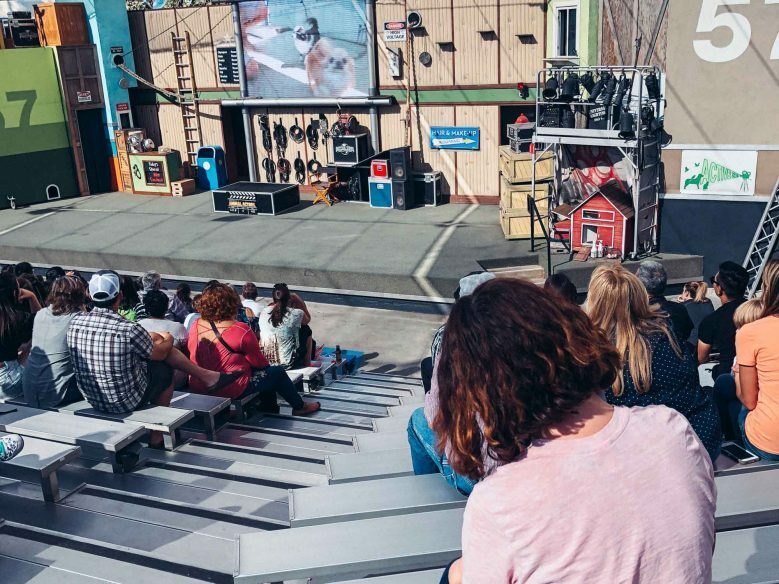 The high-octane live-action show features lots of stunts and is a great family-friendly option. However, it could be overwhelming/frightening for some children. The outdoor arena is large and I’d advise sitting nearer the back to avoid getting wet. We took Otis at 10 months and he was entirely unfazed by the whole thing, even the big explosions. This is one to judge based on your own baby/toddler. On the plus side, you can leave at any time if if gets too much. Otis was unperturbed by the Water World show! What does Universal Studios have for toddlers and babies? The amount of things to do at Universal Studios for toddlers and babies really depends on the child. For example, how they deal with darkness or loud sounds. 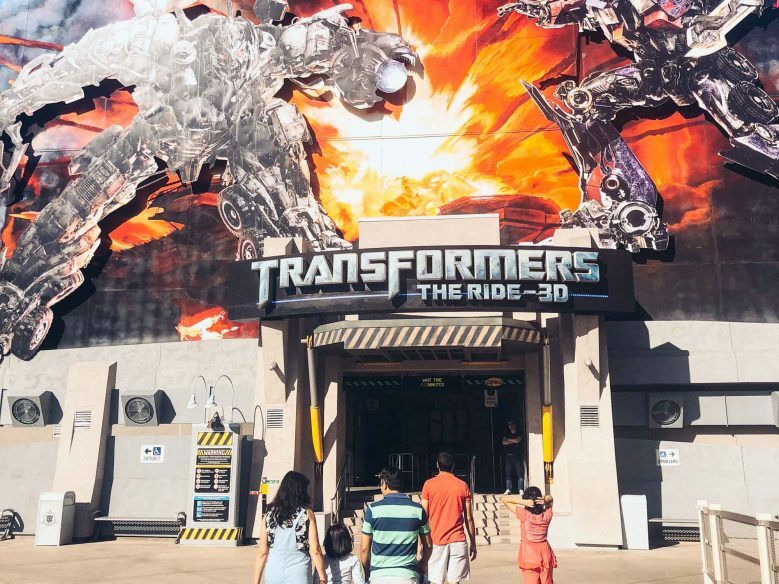 Here are some examples of things to do and toddler rides at Universal Studios Hollywood. Something that babies and toddlers of all ages will appreciate at Universal are the many characters that wander the park greeting all the visitors. At 10 months, Otis was completely fascinated by them and it was a really easy way to keep him entertained. I think the older the baby/toddler, the more exciting it would be, especially if they recognise the characters from their favourite movies. Characters you might expect to see include, Dora the Explorer; Shrek and donkey; Scooby Doo and Shaggy; the Simpsons; Minions; Kung0fu Panda; and the animals from Madagascar. Super Silly Fun Land is a Minion-themed area especially for children, designed to look like the seaside carnival in Despicable Me. There isn’t anything particularly good for non-walking babies to do beyond be entertained by the design, but toddlers will have fun exploring. And there’s a wet play area if they need to cool off. This is a definite highlight of Universal for toddlers! The Dino Play Area outside Jurassic Park is a great playground for kids. Again, babies aren’t well catered for, but it’s ideal for toddlers to burn off some energy. 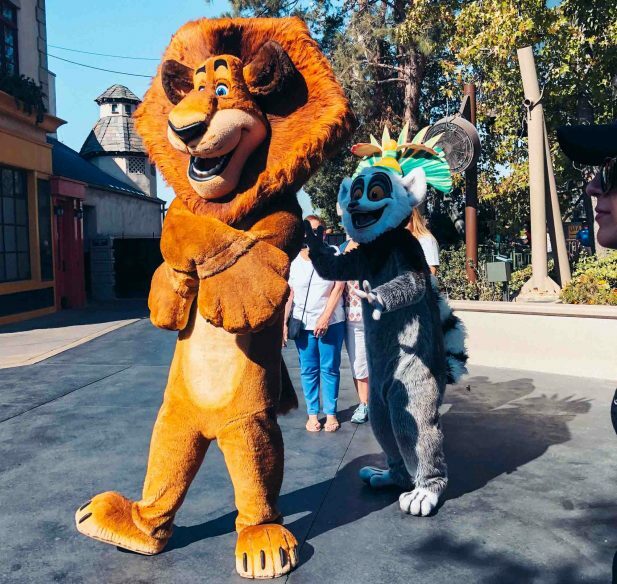 There are a few different shows at Universal and the most family-friendly is Universal’s Animal Actors, which features animal actors from movies and TV shows. It’s a big arena, so if you’re worried about the baby/toddler being overwhelmed/noisy, you can sit further back. Or if your toddler loves animals, get a seat up front. It’s entertaining for all ages. If you’re worried about how your toddler/baby might react, you can sit away from the front of the stage. Steve and I are huge Harry Potter fans, so visiting the Wizarding World of Harry Potter was the highlight of our day. 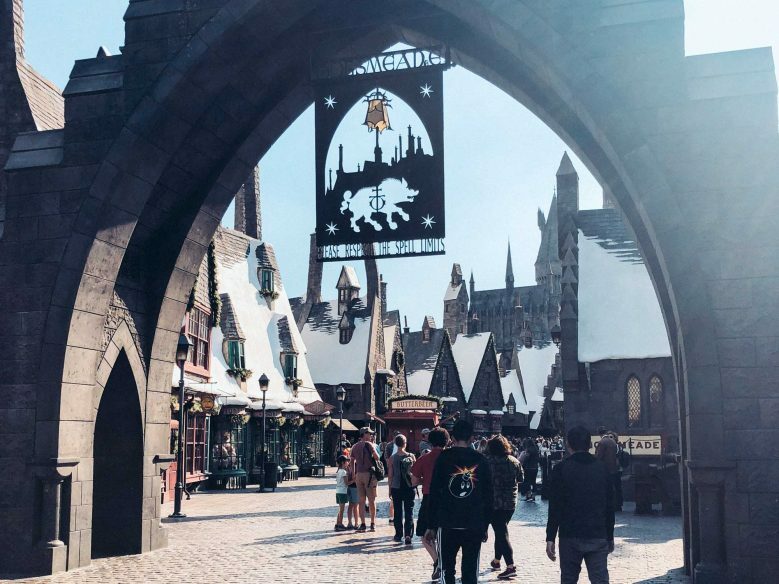 Babies and toddlers will be too young to appreciate it fully, but I think they’d still enjoy all the magical touches that bring Hogsmeade to life. There’s a wand choosing experience at Ollivanders that you can do with a baby/toddler. The only problem is, it’s quite an intimate experience, taking place in a small room with a group of people, so ideally everyone is supposed to be quiet. This is pretty tricky to guarantee, especially with a baby, so do keep that in mind. For example, if the baby cried a lot then the whole room wouldn’t be able to hear the show. We took the risk and Otis did okay, just letting out a few shouts now and then! There are also live shows throughout the day, including a frog choir, singing songs from the movies. These shows are good options for babies as there are no specific baby rides at Universal Studios Hollywood. Are there rides for toddlers at Universal Studios? There are a few attractions at Universal Studios that would suit a daring, and in some cases tall, toddler. These are the options of Universal Studios rides for toddlers. This is a slow, junior roller coaster. The height restriction is 99cm (39 inches). This lively 3-D ride is a big treat for Despicable Me fans, but might be a bit overwhelming for toddlers. You also have to be at least 102cm (40 inches) to ride. There are no height restrictions for the 4-D Kung-Fu Panda theatre experience, so this is one that slightly older toddlers can enjoy. As with all the 3-D and 4-D experiences, it can be quite intense, so probably not one for toddlers who are easily overwhelmed. There is no dedicated baby care centre at Universal Studios Hollywood, but there are baby changing facilities in all the restrooms. If you want privacy for breastfeeding, there’s a nursing area in the first aid station. You can hire single and double strollers at the park entrance. There are lockers available for storing any extra luggage you have. There’s plenty of parking available outside the studio entrance and it costs $25-50 per day, depending on how close to the park you want to be. 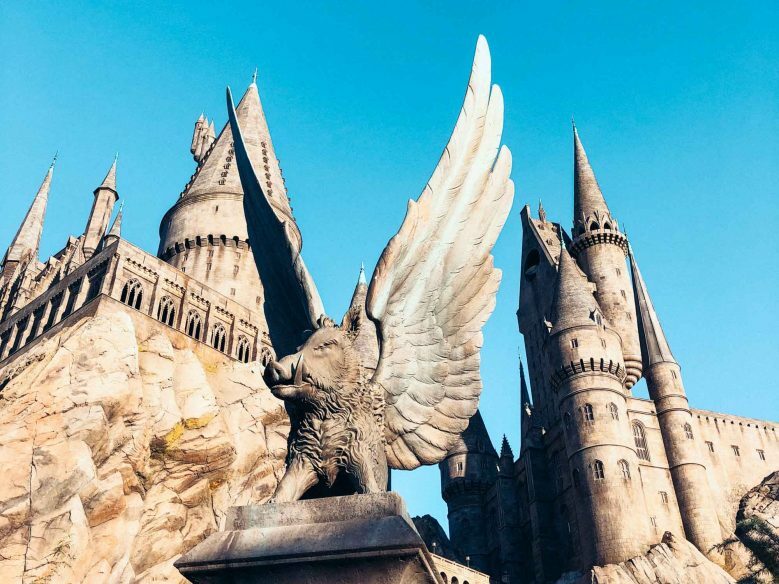 There are plenty of restaurants to choose from in Universal Studios, including a few themed options, such as the Three Broomsticks, Gru’s Lab Cafe and Krusty Burger. We ate at Mel’s Diner, which had a high chair for Otis. 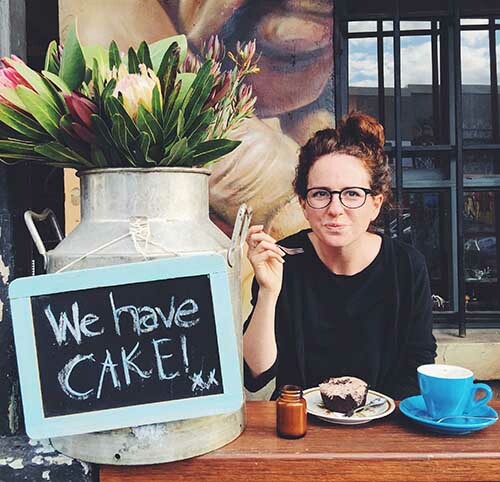 If you or your child has dietary requirements, there’s a handy dietary guide on the Universal website, which lists all the various options at each restaurant, including vegetarian, gluten-free and peanut-free. 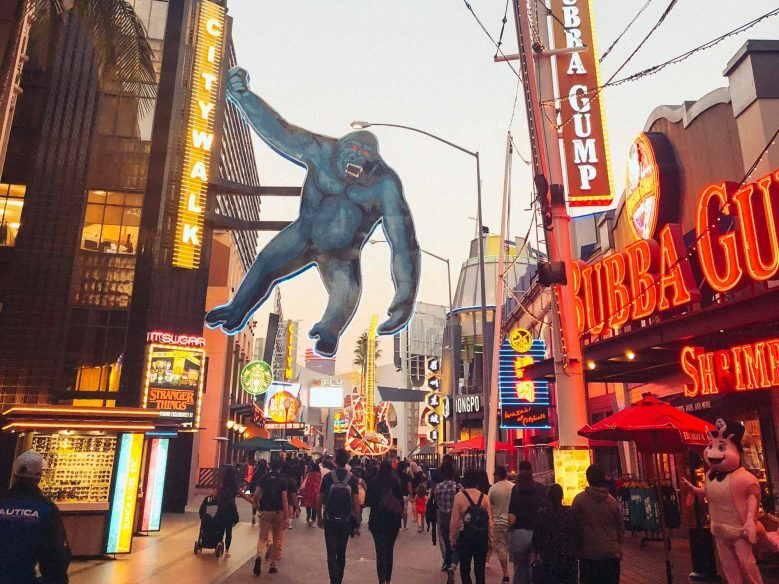 Just outside the park is Universal City Walk, which has lots of American favourites, like Bubba Gump Shrimp Company and a Hard Rock Cafe. We stayed at The Garland, a hotel just 10 minutes from Universal Studios. They even have a free trolley service that takes you to the park and saves you money on parking. 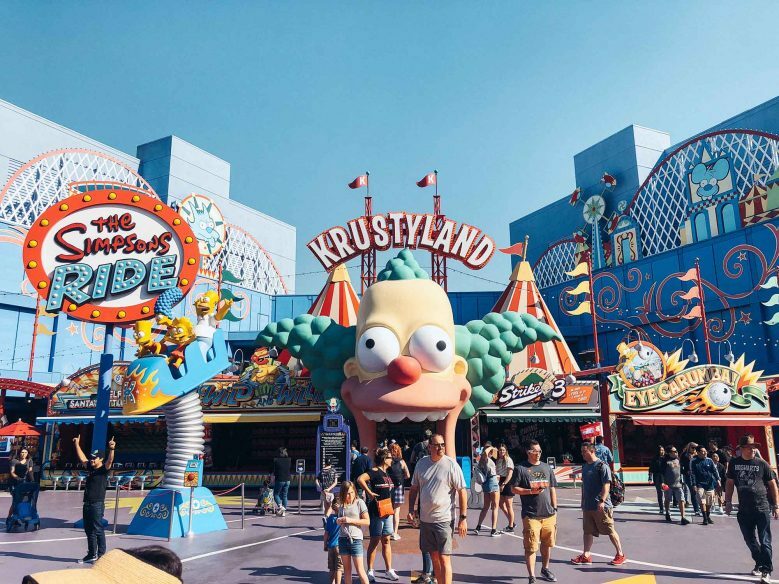 However, the hotel’s benefits stretch far beyond its proximity to Universal Studios and its a place I’d recommend whether or not you’re visiting the park. It’s an ideal option for families. 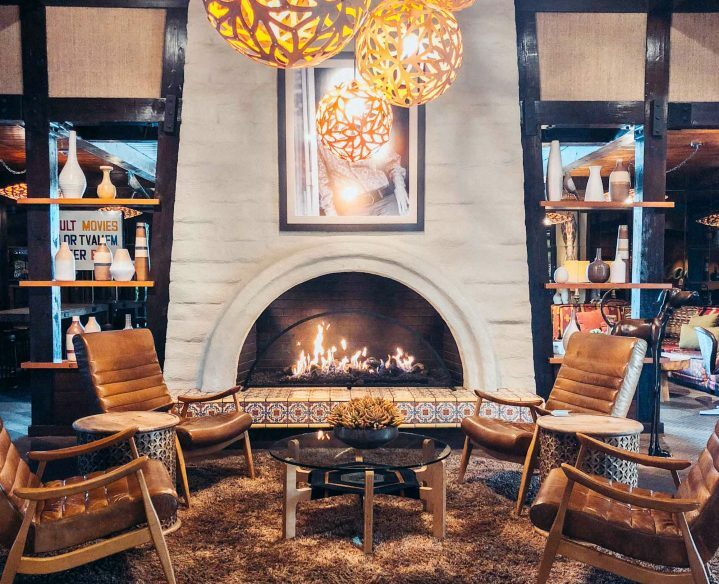 The Garland is a stylish boutique hotel with retro-cool decor and an interesting Hollywood history – it was built for the actress Beverly Garland by her husband Fillmore Crank, and their son James runs the place nowadays. 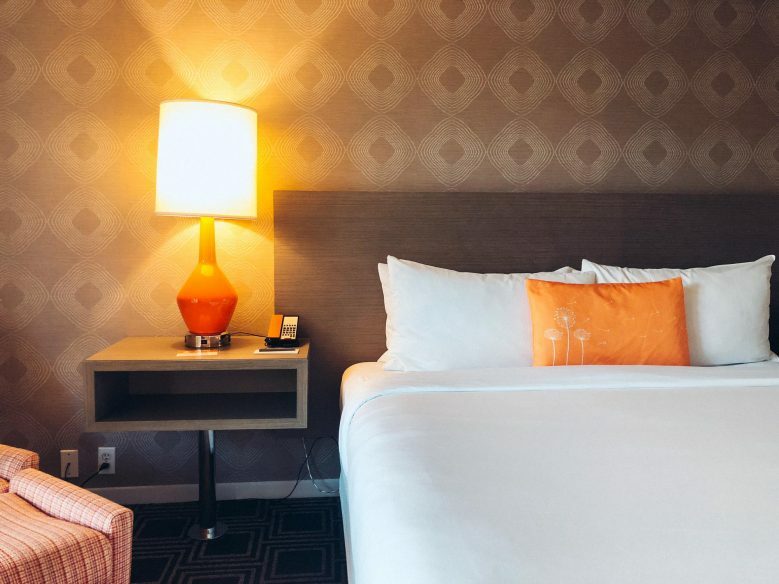 James has overseen an impressive renovation project that has modernised the hotel while celebrating its history with a design that echoes California in the late 1970s – think warm orange tones, bold patterns and retro touches, like classic dial phones in the hallways. The hotel is well set up for families, and kids will love the outdoor pool. Plus they have special rooms and suites for families that come complete with a partitioned area for bunk beds. As we just had Otis with us, we stayed in a deluxe double room, which had plenty of space for a cot. We were travelling with our own travel cot, but the hotel can also provide these. 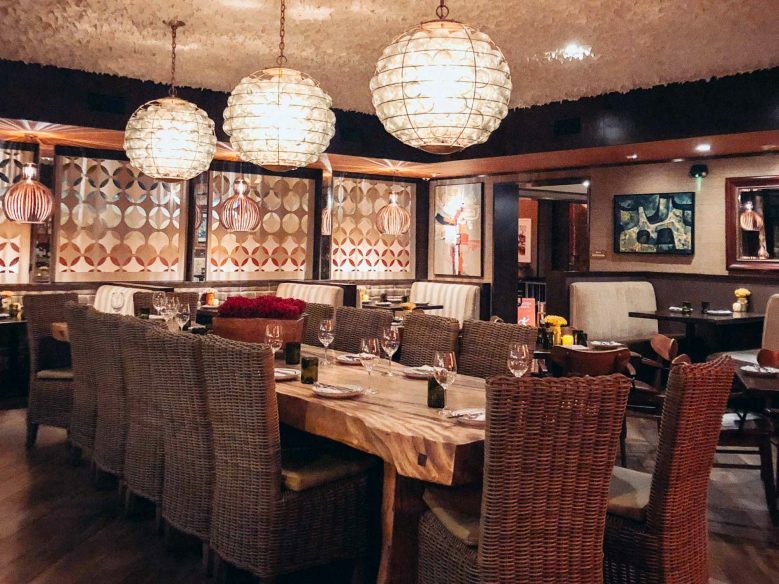 Although the Garland is family-friendly, its sophistication also lends itself well to couples or friend’s getaways. And they have a fun programme of events, including movie nights by the pool. Other notable benefits include a well-equipped gym, and a coin-laundry room, so you can do your washing without paying what are often exorbitant hotel laundry fees. 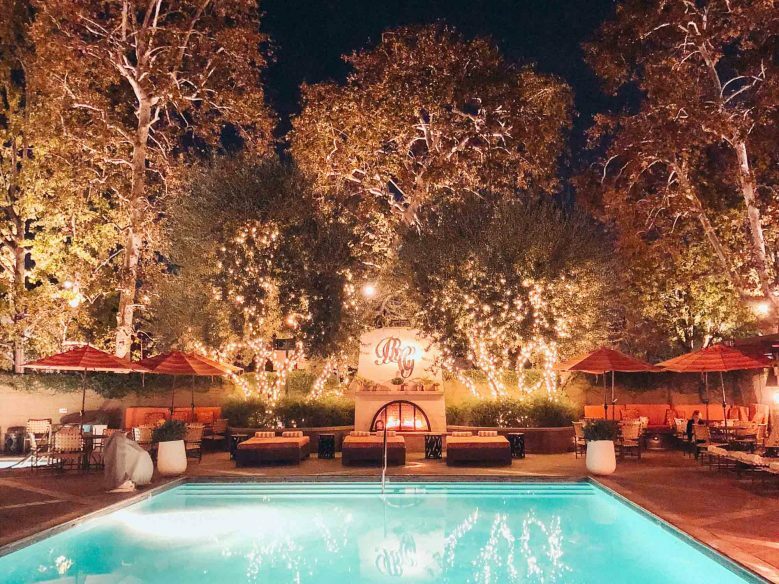 The Garland is also home to the beautiful Frontyard restaurant, which has a delicious menu of LA cuisine and a gorgeous outdoor patio that’s particularly pretty at night when the festoon lights come on and an open fire adds its glow. 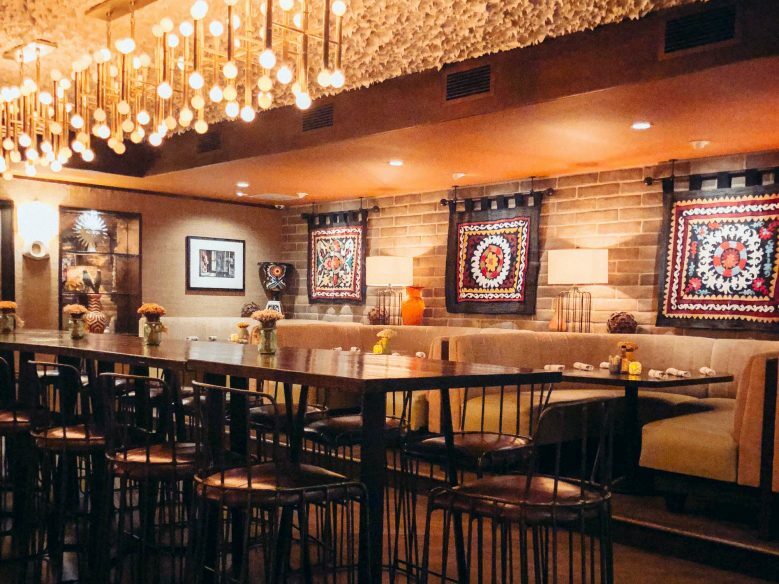 Inside is also beautifully done with seventies-style decor. 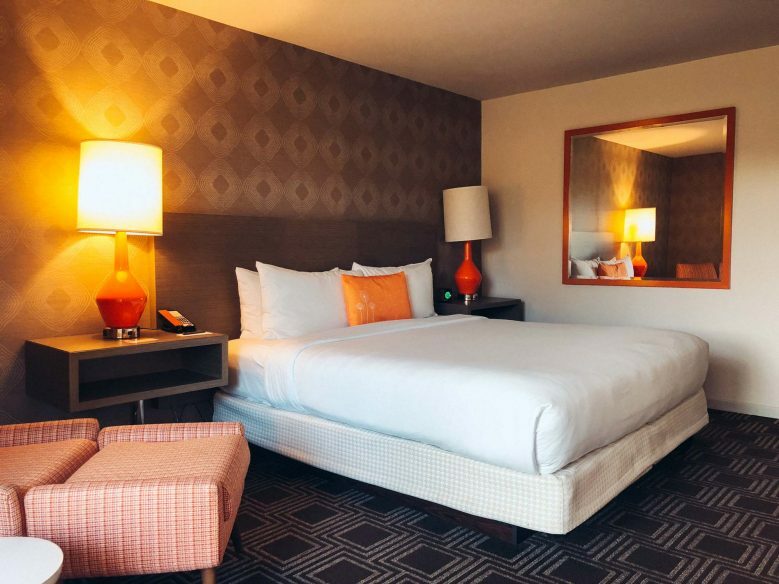 Rooms at The Garland start from $250 per room. Book your stay now. Disclosure: Our stay at The Garland was part-sponsored by the hotel. As always, all opinion are my own. Read more about how we work with brands and accommodations here.